I can’t think of a better way to ring in summer than the way we did on Thursday. For me, the day began alone in the flower beds cutting and arranging bouquets, and ended surrounded by friends and neighbors exchanging hugs, laughs, and recipes. Let me back up a little to give you some context. A little over two years ago, I quit my job in advertising to take up farming and beekeeping, in the city, with hardly any knowledge of how to do either. Now I manage a third of an acre urban U-Pick farm, Farm Stand, and local restaurant sales for Growing Places Indy. I started out as a summer farm apprentice, and by the fall, was hired on to build out an unused, grassy field into a productive, beautiful, and educational urban farm. My farm site, located next to the Chase Near Eastside Legacy Center on the Arsenal Tech High School campus, is an urban veggie U-Pick farm, which is pretty unique. Anybody can come and pick their own produce (don’t worry, I’m always around to act as a guide and answer questions) or buy what we’ve already picked from our five micro farms. Hint: it’s cheaper to pick your own and you’ll learn a lot in the process! We don’t use any pesticides or nasty chemicals on our produce and sales go to fund programming like our after school “Eat Well Club” (a session started today) and our family nutrition classes. As if that wasn’t enough, our newest batch of Summer Apprentices and Arsenal Tech High School Interns also just started their first week learning about sustainability, the food system, how to run an urban farm, and yoga. Here’s a peek into what the busiest day of the year looks like for your friendly neighborhood urban farmer. The Farm Stand and U-Pick is now open every Thursday evenings 4-7pm through September. We also have by-donation yoga classes from 4-5pm in the Chase Legacy Center. We accept SNAP (aka food stamps) and there’s plenty of free parking. Good morning! Beautiful and edible! Hey girl! Bees are already out hunting for nectar. As they bounce from bloom to bloom, pollen is distributed- that’s pollination. 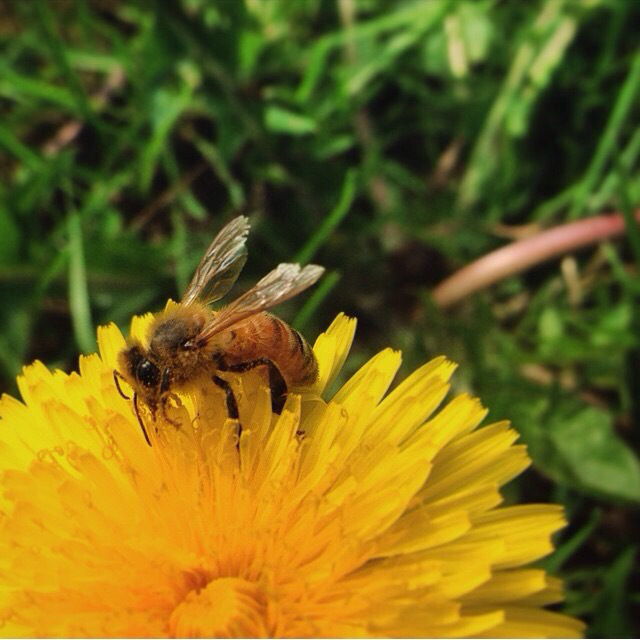 We rely on bees (and other pollinators) for one in every three bites of food we eat! Making flower arrangements for the Farm Stand tonight! We’re prepping for the Farm Stand tonight as well as harvesting veggies for local restaurant orders, our CSA “Veggies Share” members, and some goodies for our Summer Apprentices. A whole lotta pickin’ goin’ on! The whole Growing Places Indy crew!